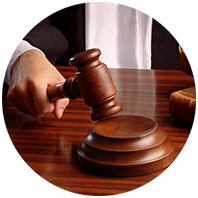 We provide skillful and dedicated representation for both Plaintiffs and Defendants in US State and Federal Courts. You have probably come to this site because either you, a friend, or relative has been injured through the fault of another party in the United States. In general, the law of negligence regulates situations in which one party is harmed by the unreasonable acts of another. Classic cases of negligence, involve circumstances in which a driver of an automobile either runs down a pedestrian or rear-ends another motorist or otherwise causes damage by not driving carefully. Medical negligence involves a case where medical staff, usually but not necessarily, a doctor, provide treatment which falls below that normally expected of a reasonably careful professional. An owner or operator of a business or other premises may also cause a customer upon the premises loss by creating an unsafe environment. There is no one single law that governs negligence in the United States. Each of the fifty states have their own laws and regulations. On top of this, certain matters are within the jurisdiction of the Federal courts. Sometimes the parties can elect to file a lawsuit in either federal or state court. Other times matters are submitted to arbitration. Some states restrict the ability of injured people to claim damages or cap or limit the damages awarded in certain circumstances. Unlike many other countries, in the United States most civil litigants have the right to trial by jury. An American jury is normally 12 persons drawn at random to listen to all the evidence and who render the final verdict and often fix the damages to be awarded to a Plaintiff. The fact that damages are fixed by juries often leads people to believe that damages in the United States are higher than in many other countries. This is not necessarily the case. Whatever, the situation, the attorneys at Capp & Associates can frequently assist by providing either direct representation or working together with local attorneys should need be. American attorneys typically represent their clients on contingency-that is on a no -win no fee, percentage recovery basis. 3. That you suffered loss and damages as a result of their carelessness or 'negligence'. How long do I have to file lawsuit or make a claim? Once again the answer to this question depends on the laws of the which state in which you were in when injured. To answer this question requires a detailed analysis of your circumstances. However, and generally y speaking, the time in which you can sue, known as the 'Statute of limitations', usually varies form 1-2 years., and in certain circumstances can even be less. Thus, we cannot stress enough the importance of seeking qualified legal advise so as not to unwittingly waive or abandon your rights. The information contained in this site is provided free of charge. It is intended for informational purposes only and should not be construed as legal advice or a substitution for obtaining legal advice from an attorney licensed in your state. The transmission of information on this website is not intended to create, and its receipt does not constitute, an attorney-client relationship. For personal legal advice, please consult your California business lawyer. Copyright © 2017 Capp & Associates. All rights reserved. Web Design by Action Web Development.